Considering the fact that I have a giant SL shoe fetish, I can't believe that this is my first shoe posting. :O It is just not possible. I ran across these shoes in the FashCon notices a while back - they're newish sculptie shoes from Insolence, famed maker of oh-so-yummy lingerie, now turned couture cobbler. They come in two sizes, many colors, two finishes, and are modifiable, so the ankle strap doesn't go through longer or thicker ankles - I just love the way they look - nice clean lines and the shoe clothing piece doesn't mangle your ankle joint so that your limbs look like they were broken to fit into the darn shoe. 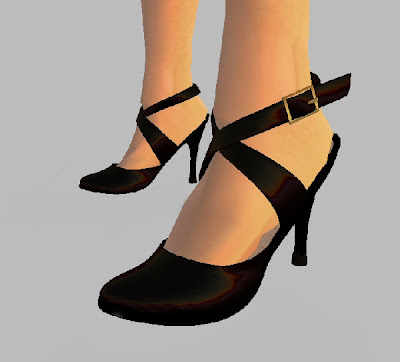 Too many cruel shoes in SL! The Elise shoe gives a nicely turned ankle that's doesn't make you squeamish to look at! Elise sculpted black vinyl stilettos, at Insolence in Venom, $399L. Second Life filmmaker Rob Wright (Robbie Dingo) collaborates with electronic musician Kirsty Hawkshaw for the Millions of Us first Artist-in-Residence Program.